Born in Siegburg, Wolfgang Overath, is regarded as one of the best midfielders in German soccer history. He began with SV Siegburg 04 as a boy, but moved to 1.FC Cologne at the age of 20. This was the club he remained faithful to through-out his career, playing almost 800 games in all competitions. He got a flying start at the club winning the Bundesliga in his first season as well as being called-up to the national team. 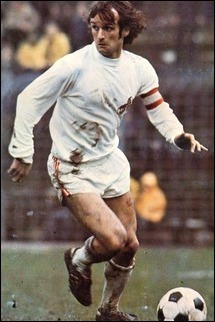 He won further domestic cup titles with Cologne in 1968 and 1977. Wolfgang was still only twenty-two by the time of the World Cup in 1966. Still he played an important role as West Germany reached the final and lost to England after extra time. Overath was virtually a complete midfield player. He was strong man-to-man, was blessed with a powerful left foot and seemed to peak his form to the important games. He was definitely a tournament player and in the 1970 World Cup, the international media voted him as the best midfield player in the tournament. West Germany took third place in Mexico with Overath scoring the winning goal in the bronzematch against Uruguay. His international career ended after the 1974 World Cup on home soil. It was a perfect way to end a great career by crowning it with a World Cup title. Once again Overath was on top of his game through-out the entire tournament and also knocked in two goals, against Australia with a left footed rocket and also against Sweden. Overath became the only man in World Cup history, along with Beckenbauer, to win gold, silver and bronze in the World Cup. He continued to play for three more seasons in Cologne before retiring in 1977 lifting the German Cup trophy having beaten Hertha Berlin in the final. It was the last game of his career.